Research finds 18% of Jewish immigrants from US and Canada live in territories; only 5% of their counterparts from the UK do the same. A new study by a British research institute confirms a longstanding supposition in the Jewish world: the British are less politically right-wing than their North American counterparts. A report by Maariv newspaper indicates that the vast majority of the immigrants to Israel from the UK do not consider living in Judea and Samaria (Shomron) communities, a move that is far more popular with US and Canadian immigrants. The Institute for Jewish Policy Research (JPR) published this week a study that found only 5 percent of Jewish immigrants from Britain decide to live in Judea-Samaria, as opposed to 18 percent of North American immigrants. 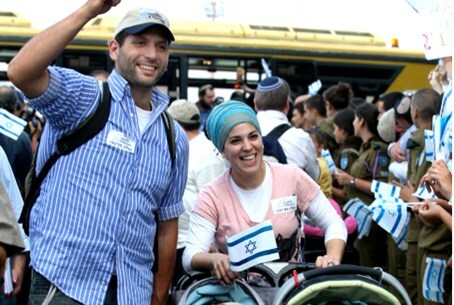 The Jewish Chronicle newspaper, which published the study, also noted that in 2008, over 21,000 Jews born in the UK were living in Israel, while in 2011 it was reported that over 17,000 Israelis lived in Britain. UK immigration to Israel has been significant in numbers over the years, ranking the UK the second largest source of English-speaking immigrants after the United States. In 2002, there was an increase of only 300 immigrants from the United Kingdom, while in recent years Israel took in about 500 new British immigrants, according to the Jewish Chronicle report. It is important to note that on average, about 80 British immigrants end up returning to the UK each year, following an unsuccessful immigration. "The recent study does not surprise me since British Jewry has always been more liberal," Maariv quoted British businessman, Daniel Goldman, as saying. Goldman, who immigrated to Israel in the early 90's, serves as Chairman of the Gesher organization and Chairman of the Board of World Bnei Akiva, explains how British Jews have, in his words, always been more "open" than American Jewry. "While religious youth movements were open to such political issues such as the settlements, the majority of Bnei Akiva from the UK immigrated to Kibbutzim, much more than their counterparts in the United States." Religious Zionist Kibbutz Lavi in northern Israel has a sizable number of British immigrants, as do other kibbutzim, while the British Jewish Emunah organization does not initiate projects over the Green Line.